What you do after you refer a matter to another lawyer or professional is as important as having made the referral in the first place. The reason: you want to make sure the person you referred was well-served and fairly billed. If they weren’t, it will reflect poorly on you and do your practice harm. Call the person or client you referred soon after making the referral, within a day or two. Make sure the referred person’s call was taken or that the e-mail sent or voicemail left was responded to in a timely fashion. How important is this? Such a process is a foundational tenet of more than one of the successful international law firm networks. Those networks check to make sure referrals between members are promptly followed up upon. Eventually, ask the person you referred how well overall the matter was handled, if the results were satisfactory and if the fees charged were as estimated. One international network publicly discloses on its website what it calls a Firm Satisfaction Index, going so far as to rate the quality of representation and cost of referred matters based on feedback from both clients and referring lawyers. That kind of transparency helps everyone involved. Report back on all of this to the lawyer or professional to whom you made the referral. They’ll appreciate it, even if part of what you report back is criticism. Of course, you should ask for permission to do this from the client and respect any request for confidentiality. Refer to more than one provider at the outset. Consider giving three names. At any given time, the person to whom you are making a referral may decline the work. There are good reasons this can occur including they may be too busy to take on the matter, may have a conflict or may not mesh personally with the potential new client or assignment. Giving the person you are referring a choice, in terms of availability, temperament, fees and location, are important considerations. Notify each provider that you have made the referral and that they should expect contact. 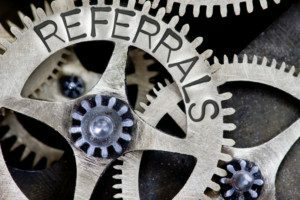 Referrals reflect directly on you. If handled with sensitivity and followed up on they will lead to reciprocation and goodwill.